Dessert before dinner. That’s how Laura and I started this evening of eating, which turned out to be all about Italian flavors. We actually stumbled upon this outpost of L’Arte del Gelato by accident, tucked away into the corner of 7th Avenue and Barrow Street, and after a long afternoon of wandering downtown on a sunny day, we couldn’t wait until after dinner for a sweet bite. Laura had the mixed berry and amaretto (my new favorite) and I had grapefruit campari with budino di riso (rice). 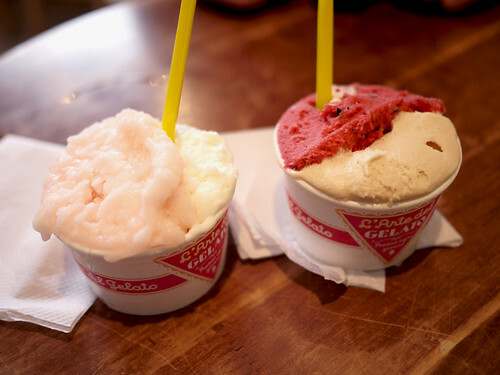 What I always love about the gelato here is the incredibly bright and intense flavors – grapefruit is slightly bitter but sweet and bursting with citrus, amaretto tastes like the purest form of almond aside from eating the nut itself. After more walking, we were completely exhausted and starving once again (no surprise there). 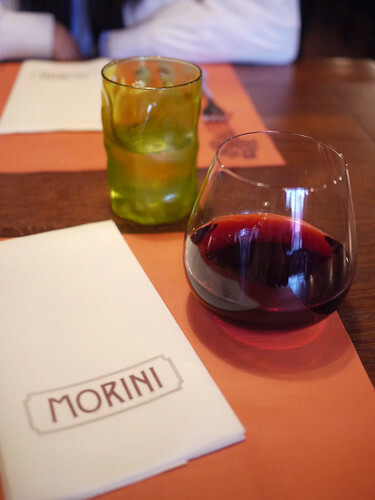 Luckily, we were very close to Osteria Morini, Michael White’s more casual Italian restaurant, and sat down to a very leisurely meal of cured meats and insanely good pastas. 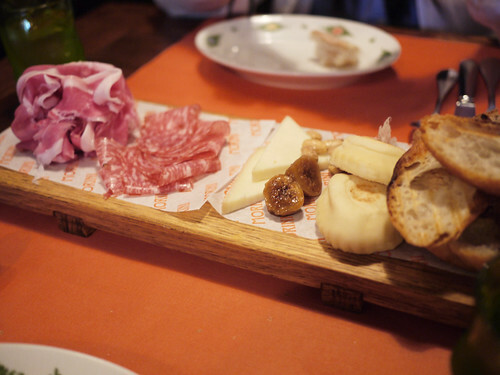 We began with a selection of meats and cheese – prosciutto di Parma, sopressata (a sweet cured pork sausage), and quadrello di Bufala (a semi-soft cheese made from buffalo’s milk). Our selection also came with a generous side of accompaniments and bread. There was grilled bread, bread studded with currants, and a puffy bun-like bread along with dried figs, roasted almonds, and a master-fat-like spread tasting strongly of pork and herbs. I can never really find complain about good quality cured meats and these were superb, and as someone who usually doesn’t care much for cheese, this buffalo’s milk choice was quite good, not too funky and quite creamy and smooth. The pastas, however, were the hands-down highlights of the meal, and I finally got to see what all the Michael White fuss is about. 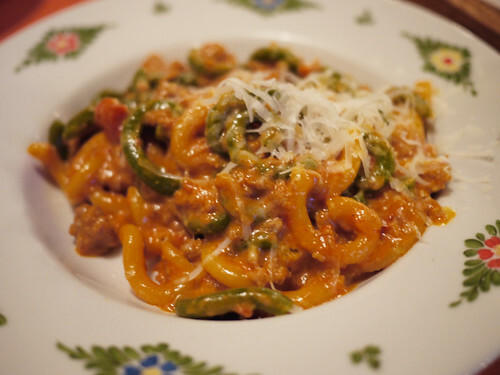 If he make a seemingly simple meat sauce this great, I can’t wait to see what he does with the bone marrow and baby octopus fusilli dish at Marea. We ordered the cappelletti, a truffled ricotta ravioli with melted butter and prosciutto, and the gramigna, macaroni with pork sausage, peas, cream, and black pepper. I know I’m beginning to sound like a broken record, but these dishes were among the most comforting, yet most intensely flavored, pastas I’ve ever had, and you could tell that they had been made fresh. 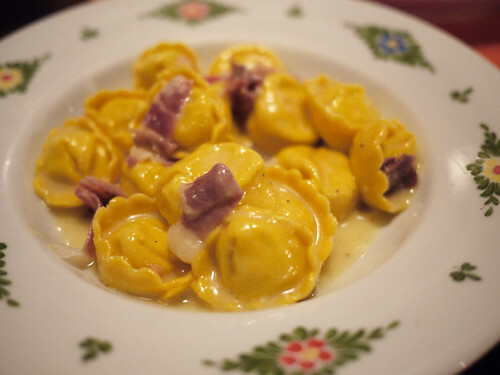 The cappelletti especially hit you on the head with its truffle and ricotta filling – creamy, earthy, and out of this world – and didn’t even need the extra prosciutto to make a strong impression. The gramigna was equally packed with flavor; the pasta had the perfect texture and wasn’t overwhelmed by the pork sausage and cream sauce, and that extra sprinkling of Parmiggiano didn’t hurt either. So, another Italian food gem in Soho. This, like OTTO, is a place that’s perfect for unwinding after a long day at work or school. 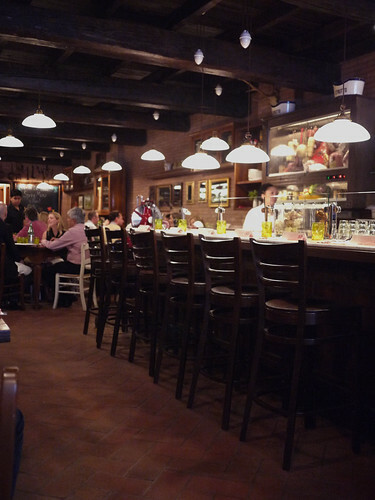 You could just pull up a chair at the bar, order a glass of red wine or a cocktail and one of the amazing pastas, and just take your time savoring each bite. 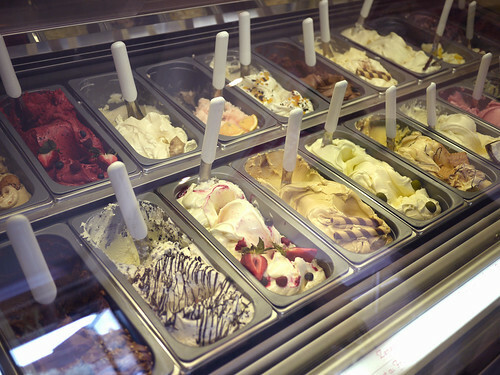 You are currently reading Gelato and Osteria Morini at Notes on Food.